You will need a Photo ID. Course outlines will be distributed at registration on Saturday. Included in your fee are course admission, comprehensive course outlines, light continental breakfast, and beverage breaks. Make hotel reservations early and be sure to mention that you are with ESP Ultrasound. Use coupon code ILOIG. Complementary Crowne Plaza Shuttle. 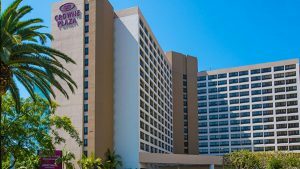 24-hour shuttle service between LAX and Crowne Plaza Los Angeles Airport. Pick up outside Baggage Claim area near red sign that states “Hotel Shuttle” Buses load at LAX “Red” courtesy shuttle stops. The Shuttle is a shared ride program, please read the variable message sign to identify the bus for Crowne Plaza LAX. Shuttles depart from hotel motor lobby every 20-30 minutes throughout the day. For ESP attendees, parking has been reduced to $8 per day and $14 per overnight stay. Complementary internet access is available for overnight guests in room and in lobby area. Business center, fitness center and outdoor pool. We have provided driving directions as a guide. Please call hotel for current and accurate driving directions. Follow Santa Monica Freeway (10) west to San Diego Freeway (405) South. Follow San Diego Freeway (405) South to Century Blvd Exit. Follow Century Blvd West to the Hotel. Turn right at hotel into driveway. Follow San Diego Freeway (405) North to Century Blvd Exit.